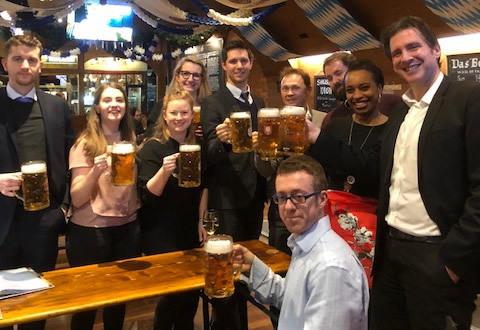 Fulham based chartered tax advisors, Warrener Stewart’s tax team take time out after a busy January. Over the last four years, private client services have grown steadily, through the teams hard work the number of tax returns filed this year increased by 10% compared to last year. Commenting on the team efforts, tax director Ryan Lane explained, “As part of our private client services we provide advice to business owners and individuals regarding their personal tax affairs, which includes the preparation of their annual self-assessment tax return. The offices will be closed during the Christmas week until 2nd January 2018. The current economic climate has not deterred five young professionals choosing accountancy as a career and joining chartered accountants in Fulham, Warrener Stewart. As chartered accountants and chartered tax advisors, Warrener Stewart specialises in meeting the needs of small and medium sized business, helping them to fulfil their business potential. The five new starters specifically choose Warrener Stewart because they wanted the opportunity to work with SMEs from a variety of sectors. Pictured above are (left to right): Fo Uwhubetine, Demi Brindley, Victoria Ikudehinbu, Alex Hollomby, Ali Dessain. Joining the Audit and accountancy team are Ali Dessain, Demi Brindley and Fo Uwhubetine. For recent history graduate Ali, this is his first stepping stone towards a career in accountancy, following his graduation from Trinity College in Dublin. Whilst for Demi, having completed her AAT qualification in 2013, she has also chosen to continue her career as a Chartered Accountancy trainee and study for her ACA Qualification at Warrener Stewart. Likewise, Fo, having studied Accountancy and Financial Management whilst at the University of Hull, is keen to progress her career in business whilst training with Warrener Stewart. Warrener Stewart’s Tax department has grown steadily over the past five years, providing advice to both businesses and their owners on UK and international tax issues. It was this diverse nature of the Tax department which attracted Accounting and Finance graduate, Victoria Ikudehinbu to join the team so she could expand her career in US tax and continue to study to become an Enrolled Agent alongside her ATT exams. As a recent Classics graduate, Alex Hollomby has chosen to put his attention to detail to good use by launching himself into a career in tax. “In the current economic climate our clients are relying upon us more and more for business and tax advice. Through our recent recruitment we can continue to grow and maintain a high level of service to our clients,” commented Colin Edney, joint managing director of Warrener Stewart. The banking sector in the UK has recently seen several new banks evolve; one of the latest, Redwood Bank, a new bank focused on small to medium sized businesses, used Fulham chartered accountants, Warrener Stewart’s expertise to help set their company up. Co-Founder of Redwood Bank, Jonathan Rowland, enlisted senior partner, Colin Edney and his team to assist them with laying the foundations for his new bank. “This has been a really exciting project to work on,” commented Colin. “It was very gratifying when Redwood Bank’s full banking licence went live at the end of August”. The bank formally launched in September, with launch events in Letchworth and Warrington. With Redwood Bank providing market-leading deposit rates and a fast turnaround time for asset-backed lending, Colin believes they will fulfil a vital role in the financial market by assisting SME business customers. The person of significant control (PSC) regime introduced from April 2016 will see important changes come into effect from 26 June 2017. From that date any changes to a Company or LLP’s PSC information will require notification to Companies House on an event by event basis as opposed to annually via the Confirmation Statement. These changes are necessary in order for the UK to comply with the EU Fourth Money Laundering Directive which takes effect from 26 June 2017. At present companies are required to report PSC information on an annual basis within their Confirmation Statement submission. Any changes required to the PSC register are made within this submission alongside updates to changes to shareholders, share capital, SIC codes etc. The new procedures require PSC information to be updated as and when changes occur. New PSCs, ceasing to be a PSC and changes to existing PSC details must now be updated on the company’s own PSC register within 14 days and then the company has a further 14 days to report the changes to Companies House. In essence, any changes must be reported to Companies House within 28 days of them occurring. The relevant changes must be reported to Companies House via the new PSC01 to PSC09 forms and equivalent LLPSC01 to LLPSC09 forms for LLP’s, or, as is now more common, through Companies House Webfiling. With these new changes in mind, it is imperative that when changes take place to share capital, shareholdings, appointments and terminations of directors, that the PSC register is reviewed and updated at the event date so any changes to the PSC records can be notified to Companies House within the required time frames to avoid penalties.